Before starting any building work, you should always plan where the garden building is going to be located. There are a number of factors which are important to consider for the location, before actually getting started on constructing the build itself. We’ve created a checklist for you to run through before you start the building work. This way, you can avoid any potential problems you might face when building your shed! Access to delivery and all sides of the build for maintenance and applying wood treatments. You are happy with the view of your garden from the planned area. Whether you intend to run an electrical supply to the building. Natural light, a well-lit area is best if the building is to be used as a workshop for example. There is no surrounding foliage or young trees that may grow in the future. A shed base is an essential part of the building which will provide a solid foundation for the unit. 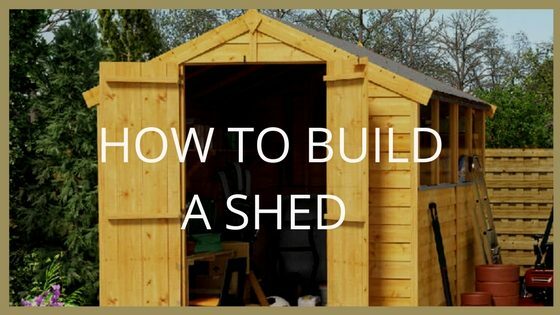 Building the base might seem like a daunting task at first, but, by following these simple steps, it should actually be an easy and straightforward process, so your new shed will be up in no time at all. 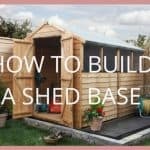 Read our article which has step by step guides for how to build a shed base. 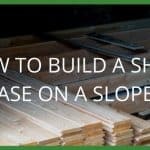 If your garden is located on a slope, we also have all the useful tips you need to build your shed base on a slope. 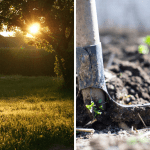 There are a number of flooring options available for your garden shed and each of the flooring types can provide different levels of protection. Standard flooring options include a solid sheet or OSB flooring. Whereas, more premium and heavy duty options include T&G floors. The flooring is an integral part of the build which requires the right assembly to enable the shed for domestic use. Depending on the function of your garden shed, you can opt for standard or premium flooring. The materials for your shed floor vary depending on your preference of flooring. Timber floor boards are normally tongue and grooved. Then interlocking construction of the tongue and groove is makes the adjoining boards hold in place and creates a strong and sturdy floor base for your shed. If you are using sheet materials such as plywood or OSB, more than likely the boards will be square edged. To make the floor work efficiently, you should support the edges where two boards meet. Also, remember when using plywood or OSB that they have a strong and weak direction. With plywood make sure that the face grain is at right angles to the floor joists. With OSB, sheets, the strong direction is the long direction. For fixing the floorboards to the joists beneath using a nail which has a good pull-out resistance. The length of the nail should be about 2.5 times the thickness of the floor board. When designing the floor for your shed, it’s important to remember the enemy of your shed floor is water and this should be the top priority to consider when constructing the floor. Anything you can do during planning to stop water getting into the shed floor from the ground below, or from rain coming in from above the shed, the better. A polythene vapour barrier weighted down with stone or concrete beneath the shed will provide a barrier to moisture and also prevent plant growth beneath the shed. Good ventilation beneath the shed will help any damp air disperse and keep the timbers dry. Most often for sheds, the underside can be left completely open to the atmosphere so damp air cannot accumulate. Another tip to protect the floor joists is to put some Damp Proof Membrane, beneath the supports of the floor joists. This provides yet another barrier to moisture working its way up from the ground into the floor. Stop moisture getting in from above by using large eaves and gutters and making the walls drain down on to the ground. Centre the shed floor on top of your chosen base, then measure and mark in pencil the centre point of each edge. Repeat on the bottom batten of each side panel. Starting with the shed’s back panel, lift it into place, and use a long timber prop or a helper to hold it upright. Lift a side panel onto the shed floor. Choose one without a door, as the one with the door should be the final panel you raise. Screw the back and side panel together along the framing battens where they meet. Drill pilot holes and then fit three countersunk screws at the top, middle and bottom. Fit the other side panel in the same way. Next, fit the final panel housing the door. Don’t try to fix your shed frame to the floor just yet – make sure the panels are square, aligned and fitted together first (unless your instructions state otherwise). To make your shed complete, the final step is building the shed roof. As with flooring, you have a number of roof options, with the standard to premium levels of protection from the elements. For heavy duty roofing, you may want to opt for an 11mm tongue and groove roof, additional roof trusses can offer even more support for your shed roof. These are generally more expensive options but guarantee added strength for the unit. However, if you only need intermediate levels of protection, a solid sheet could be the right choice for you. For an inexpensive, value option 9mm OSB can be used for your garden shed roof. Start by fitting the beam across the top of the shed, slotting it into the pre-cut grooves at the top of the two pointed ends on an apex shed (known as the gable ends). Fix the beam to each gable end through an L-shaped metal bracket. Lay the roof panels on the ground, one at a time, with the eave sections (wooden strips) positioned underneath, flush with the bottom edge of the panel. Measure and mark evenly spaced fixing positions. Drill pilot holes and then hammer in the screws to attach the eave sections to the roof panels. Lift the roof panels into position, one at a time, ensuring everything is level and aligned. Secure the roof panels to the shed and along the inner support beam. A work platform will come in useful when fitting the roof! Check again that the shed is square on the shed floor and base before finally screwing the sides and gable ends to the floor. Adding roofing felt to your shed is a great way of providing complete protection from the harsh elements and to stop rainwater from entering your shed. There are different qualities of roofing felt which will give different levels of protection. For a value roofing felt that will provide a standard level of protection, you can opt for a sand felt roof. However, for a more premium and secure roofing felt, you should opt for a green mineral felt. 1. 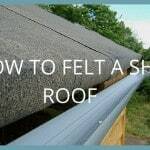 Start by unrolling the felt and then measure and cut the required amount of pieces depending on the size of the shed roof. 2. Lay the first piece of felt over one side panel, leaving a 50mm overhang at the eave. Nail it along the top edge with felt tacks in the shed about 300mm apart. Then, fix it down along the gable ends and eave with the felt tacks at 100mm intervals. 3. Repeat on the other side. Place the top strip of felt over the top of the roof and nail it along each edge at 100mm intervals. 4. Where the gable end felt meets and overhangs the front eave, hold a piece of timber beneath the felt and using a knife, carefully make a straight cut from the corner of the roof to the edge of the felt. 5. Screw or hammer the roof fascia in place using screws or nails and position this over the felt on the front and back gable ends. 6. Finish the fascia by adding the diamond-shaped wood finials (if provided) to the apex of the shed roof. Secure each corner trim with evenly spaced nails or screws as instructed. – You will at a minimum need a drill, measuring tape, and ladder to erect a metal shed. – Make sure the surface/foundation is flat and level. The holes won’t line up during assembly if you don’t and it can lead to water entering the shed. – If water enters your shed after installation, its because something has not been put together properly! Install the frame: The floor frame is where all of the wall panels slot in. So after you have built your foundation, this is your first job. Make sure that it is square by measuring diagonally from corner to corner. The measurements should be the same for the frame to be square. You can then fix the floor frame into your foundation. Erect the walls and secure them: Put the walls up and secure them together. This can be fiddly because the panels are flimsy until they are all held together. It does help to have another person help you with this.There will be braces that secure the walls so they stay together. This includes the door trim which will make the area around the door much stronger. Add the roof: Install the gables (which are at the front and back of the shed), then install the roof beams. The roof beams will give you a strong foundation to install the roof panels on. They are also where you will screw your roof panels into. Install the doors and windows: The last task to complete your metal shed is to install the doors and windows.